Yesterday I showed you the very beginning stages of our youngest daughter’s room re-do. So today I thought I’d share a quick and easy project/addition. Found this simple but sweet lil’ lamp the other day at Hobby Lobby. but I was even more interested in the clear, empty base. And the fact that it was open got my wheels turnin’. So I went on a hunt for some colored pom poms. and came across a pretty flower clip as well. 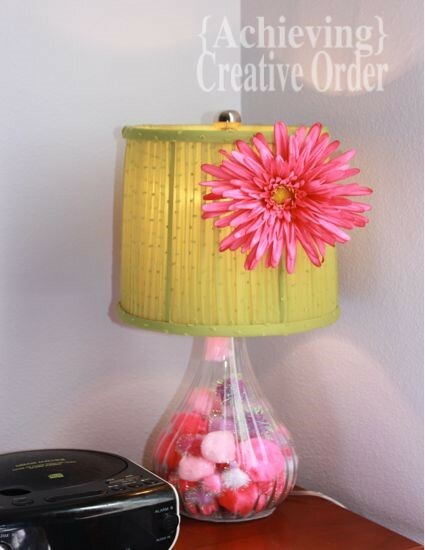 Then, I chose the pom poms I wanted and shoved placed them inside while laying the lamp on its side. And hot glued the felt circle to the bottom. Lastly, I poked a little hole and clipped the flower to the shade. And it’s now princess ready.